A Call to Action! Project Management in YiA - Stowarzyszenie Młodzieżowych Inicjatyw Twórczych "CREATOR"
SMIT "CREATOR" members were participating in a training course titled Call to action is co-ordinated by ALINHAS? and held in Porto, Portugal. “A Call to Action! Project Management in YiA” aims to increase the organisations’ management capacity in projects between EU and SEE countries by offering the participants advanced tools and new contacts. We want to increase the cooperation between youth organisations from EU countries and from SEE countries, thus augmenting their capability of managing projects in their respective communities. I had a great opportunity to take part in the training course called Call to Action implemented in November 3rd to 10th in Porto, Portugal. The main purpose of the project was to increase the organisations’ management capacity in projects by bringing together 26 youth leaders from 10 different countries and offering them advanced tools and new contacts not only from EU countries but also from SEE countries. We had possibility to meet highly motivated people from Portugal, Italy, Greece, Macedonia, Kosovo, Albania, Lithuania, Bosnia and Herzegovina and Serbia. Trainers purpose was to widen our knowledge about project management, giving also good example how to run sessions in a creative way and how to make each workshop really interesting. After few days of collecting information and tips how to manage projects we had to create ours. For a freshmen like me in the beginning it sounded like mission impossible but with help from more experienced participants and all information I had gathered during the training we managed to come up with a new project we hope to implement next year in Cracow. Call to Action as a training course gave me experience I will never forget. Opportunity given me by Alinhas? –hosting organization and SMIT Creator enabled me to develop new skills and find out my own abilities of which I was not even award. I am truly looking forward to meeting those great people again. 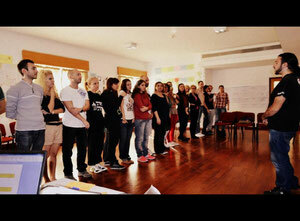 From 3 to 10 November 2012, in Porto, lasted a training course called Call to Action, which, thank's to SMIT and Alinhas? organizations, I had a pleasure to participate in. The project was meant to teach us how to create and organize our own projects under the banner of YiA program. It was a great time for me, full of new experiences and entertainment. The main issue is that I had a great opportunity to meet a lot of fantastic people from number of different countries like Portugal, Italy, Greece, Macedonia, Kosovo, Albania, Lithuania, Bosnia and Herzegovina and Serbia. It is a very positive aspect of similar projects that you can get to know different cultures and to make a lot of friends from different parts of Europe. Moreover, we had a chance to visit an amazing Porto which is famous for great wine and breathtaking bridges. During number of sessions trainers widened our knowledge about YiA program, fundraising from different sources, making a plan of the project and carrying it out. After few days of collecting information we had to create our own projects. Thanks to informal learning we kept a lot of important tips in our minds, but we didn't have to learn anything by heart. What's more, we usually worked in groups what improved our team-working skills. After a busy day we had always an opportunity to spend a great evening with the whole group . Activities like the Intercultural Evening, the Portuguese Evening or different parties let us to chill out and strengthen our relationships. Call to Action has broadened my horizons, gave me unforgettable experiences, improved my organizational and language skills and gave me the chance to meet a lot of amazing people from around the Europe. I am deeply grateful to organizers for the opportunity of being part of such an amazing team. z If you want to buy cheap GT-N7102 from China, online store Pandawilll is a good choice.